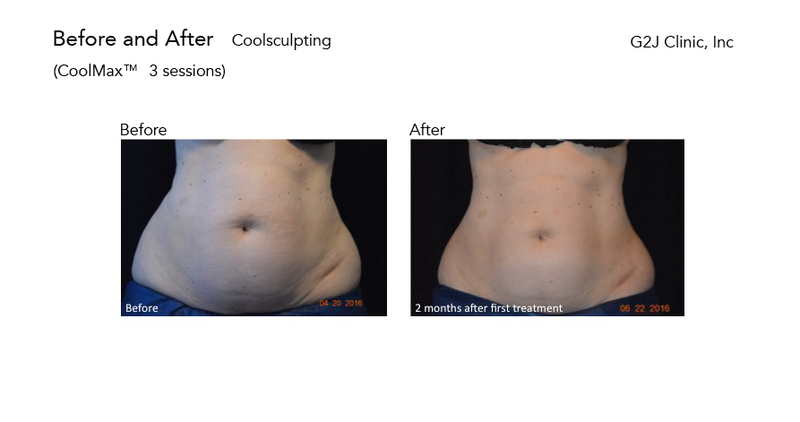 Coolsculpting is a good way to freeze and reduce fat. FDA approved safe way to reduce fat, nonsurgically, is offered to you. No downtime. No pain or minimum pain. CoolSculpting is an FDA cleared procedure that freezes the fat through non-surgical treatments by the use of controlled cooling to destroy the fat that is difficult to remove through normal dieting and exercise that would take extensive amounts of time and effort to get rid of at least one pound of fat. Controlled cooling is used to precisely target the fat cells that is located underneath the skin without affecting the surface of the skin. The fat cells that are affected will then become crystallized and then die off. Over time your body will naturally process the fat and get rid of the dead cells, resulting in a more slimmer body. The best thing about this method? No surgery, anesthesia or downtime is required to perform this procedure. All men and women who have squeezable fat in lower abdomen, upper abdomen, flank areas, thighs, and inner arms. Once the treated fat cells are crystallized (frozen), the body naturally processes the fat and eliminates these dead cells. Once the treated fat cells are gone, they're gone for good. Indeed! The CoolSculpting procedure has a 95% patient satisfaction rate. Your provider will help you create an individualized treatment plan tailored to your specific goals. While some patients may see results as early as 3 weeks after their session, most dramatic results are usually seen 1-3 months after treatment. 1 hour per each cycle. 1 applicator is equal to 1 cycle. Lower abdomen below umbilicus is needed to have 2 cycles or more if needs further. It varies depending on your needs. If you wish to reduce the size of clothes, you may need less treatment. If you wish to sculpt more, you may need more treatment. Usually 1 treatment reduce 20-25% of fat. The effect of the treatment varies depending on individuals. You may experience very mild swelling, redness, and warmth on the treated area, but it resolves in few days. You may also feel numbness, and it resolves in 3-4 weeks spontaneously. Sometimes people (10-15%) experience late-onset pain, and you can take pain medication (Gabapentin) for few days. Many people, after seeing the results from their CoolSculpting procedure, take even better care of themselves. However, if you do gain weight, you may gain it evenly all over your body, not just in the treated areas. It is important that you set up a plan to better maintain your weight before scheduling the procedure and to follow it after the procedure.